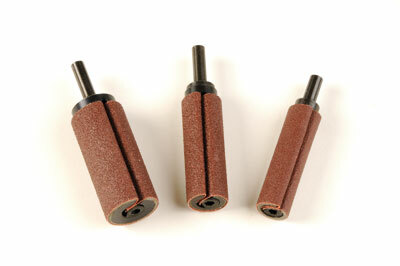 Bobbin sanders have been a Godsend for manufacturers for many years but Carroll Tools spotted a gap in the market a little while back and made some with 1/4in shafts that can be used by hobbyists in drills and hand-held flexible sanding shafts like the Kirjes or Foredom carving units. The mini drum sanders are sturdy, well made and compact, and are available in various sizes to suit small and large jobs respectively. The abrasives are wrapped around the mandrel - which is coated with a high-density urethane or something similar - and the ends of the abrasive are placed into a slot. At the end of the mandrel is a hex-head eccentric cam locking system which is rotated until it clamps the abrasives in place. Quick and devilishly simple to use, and very secure. For full security one needs about 10-12mm clamped into the cam system. Effectively this means that one can use various types of abrasives found at home - simply cut to the size required and away you go. This reduces the cost of buying ready-cut pieces and gives you more options as to the type of abrasive and grit grade you use. The mini sanders perform very well indeed when used in a cordless drill, on a pillar drill and in a flexible shaft sanding unit. These are the three holding methods I use with bobbin sanders and these performed faultlessly. They are well engineered, some of the finest I have seen in fact, and will no doubt give years of good service. "The mini sanders perform very well indeed when used in a cordless drill"